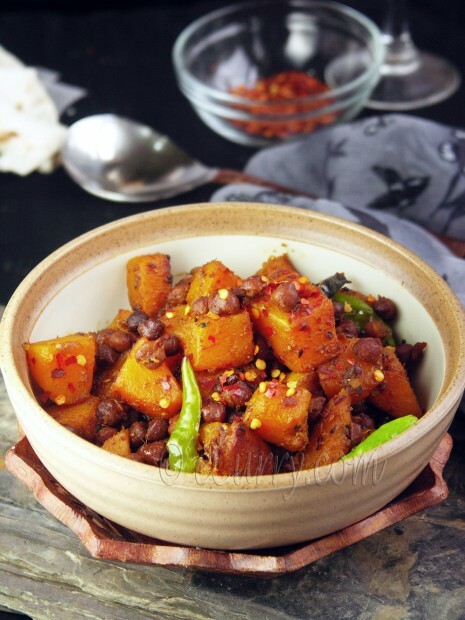 As a very typical Bengali vegetarian dish, the recipe never uses onion or garlic. It is flavored with the classic Panch Phoron/Indian five spice.The trump card of Bengali cooking probably is the use of mustard oil and the panch phoron; this spice mix is used as tempering at the beginning and as well as to finish off the dish. Spicy, with a light hint of sweet, beautifully flavored and full of texture and nutrition, I could have this any time of the year. I remember this being cooked in the iron kadai/wok at home, which imparted a very nice flavor, or is it only my nostalgia? To keep up with the tradition I always make this in my cast iron pan. The color, ingredients, and the flavors are so right for this season that I had to post this now. Pumpkin is used in the original recipe, but I prefer using butternut squash as the squash seem to hold up the shape better than the pumpkin. Weekend Herb Blogging, initially started by Kalyn, turns 5 this week! Haalo (of Cook Almost Anything) herself is hosting this special edition. If you want to participate, head over to her announcement. 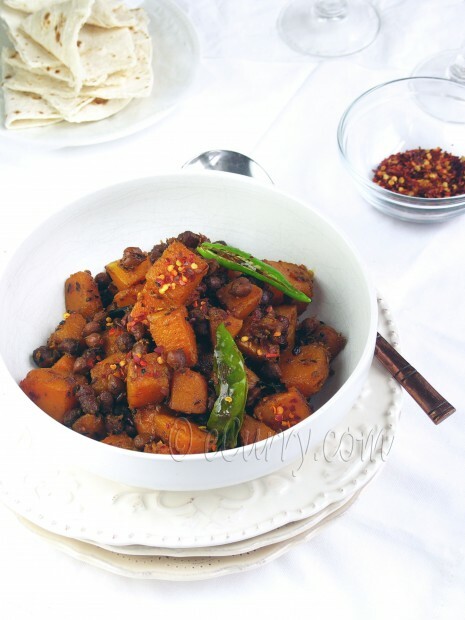 This recipe is a traditional Indian recipe with a local and seasonal ingredient and I am heading over to WHB with my dish. Sometimes potatoes are used along with the pumpkin/squash. If you wish to use potatoes, dice them in the same way as the squash and cook them along with the squash. My ma would use a little bit of ghee at the end of cooking and also use some roasted panch phoron to finish off the dish. With or without the ghee and the roasted powder, this dish is amazing, and very uniquely flavored. With the Thanksgiving around the corner, The Kumror Chokka would make a vibrant side dish for your Holiday table. This is a combination of 5 spices in equal quantities. For the Authentic Taste, do not skip any of the spices, for each of them lend their own flavor & taste. The seeds of the spices should be all kept whole, not ground into a powder. Soak dried brown chickpeas/bengal gram in water for at least 8 hours, overnight is better. If you want to par boil them, cook the soaked chickpeas in the microwave with lots of water for about 10 minutes. Or cook on the stove covered or in a pressure cooker. Drain. Peel and dice the squash. ( I do a dice and then peel, as I find it easier to peel the smaller pieces). Divide the panch phoron/Indian five spice into half. Save half the amount and lightly roast the other half. Cool the roasted spices and finely grind them. You can save if you have any leftover, for later use. Heat the oil in a pan. Put half of the panch phoron/Indian five spice, dry chilies, and the asafoetida/hing in the hot oil. When they sizzle in about 30 seconds, add the diced squash, salt, sugar, turmeric and chile powder and toss them till all the oil and the spices coat the dices squash. When they are done, just before you switch off the heat, add a teaspoon of ghee and one teaspoon of the roasted five spice powder. Switch off the heat and garnish with fresh cilantro and pepper flakes if you want. Bright colors, nutty chickpeas, tender sweetish squash, flavorful and warm – this is one is a perfect fall recipe. November 15th, 2010 | Category: Dry Fries, Sides & etc. A dish I’d love! A wonderfully healthy and healthy meal. Thats a droolworthy dish, love the combo.. Squash and chick peas…never tried this combination before. Sounds wonderful! Soma, your Chokka looks terrific. I like the idea of finishing it off with the panch phoron powder. Will try it next time. That is one lovely side dish Soma, a combination that is unique and I bet tasty. An unusual combo with full of flavor side dish! 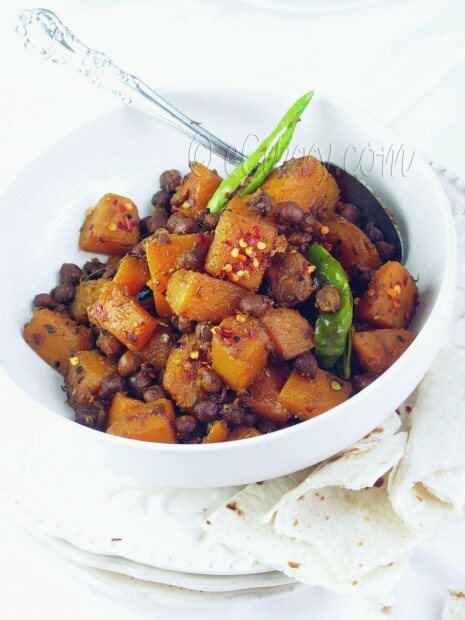 looks so perefct…..love the color of the dish….never had pumpkin & chickpeas combined together,I’ll like it I know, love all those flavors……I love the flavors of panch pooran spices….use it in many dishes, love the aroma it’s very much like punjabi aam achar…. A new way of cooking pumpkin for me! 🙂 And I know that it’s delicious. 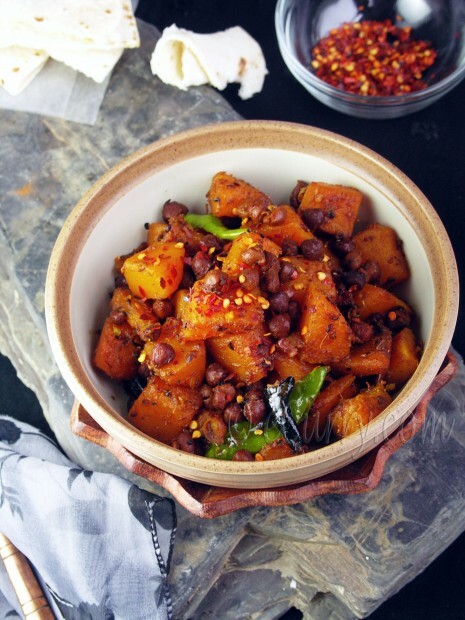 Lovely combo of butternut squash and black channa. Will try it with pumpkin, don’t get butternut squash here. You’ve made a wonderful dish, Soma. I adore butternut squash and it looks lovely with the chickpeas. A very healthy combination too! What a beautiful curry, I just want to start eating it now! 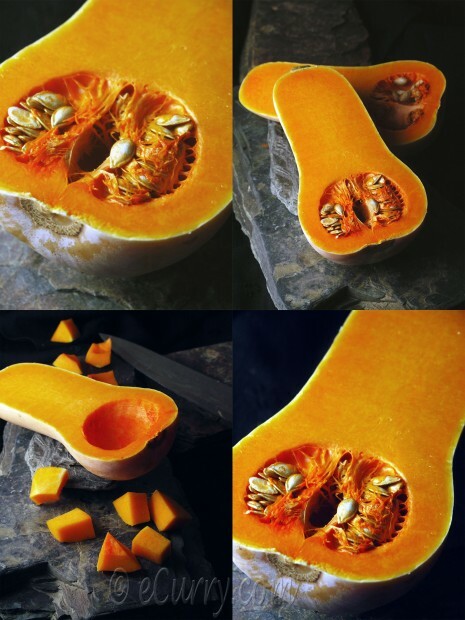 I love butternut squash, so I am sure I would like this dish. I have never tried the combination with chickpeas. I am intrigued by the combination of spices. Great recipe idea, and also woRks very well with fresh pumpkin. I did however put my own spin on it. I used 1 shallot minced in with the squash, and it I finished the dish with toasted hazelnuts and the juice and zest of .5 lemon. I did this recipe but used yellow squash and zucchini instead of the butternut squash for summer. It was great!